DearMYRTLE's Genealogy Blog: Was he there when his unit fought in the US Civil War? Was he there when his unit fought in the US Civil War? Via DearMYRTLE's Facebook Page, Danine Cozzens says "Wow. It just hit me that I have all these Civil War and Rev War ancestors and have never cross-checked their units and which battles they were in. Yet another way in which history comes alive when you really do genealogy!" +Cousin Russ replied "In my genealogy database, I have the full battle listings for two of my Civil War ancestors. DearMYRTLE and I, with our spouses, went to Gettysburg to visit where both of our ancestors fought. (Yes, against each other.) In fact, they were in the same battle. The good news, one was at the top of the hill, the other at the bottom. The Monocacy battlefield was fought on a 7th Cousin's front yard (OK, cornfield.)" a timeline of your ancestor's dates for enlistment and mustering out of service. carded medical records, in textual format at the National Archives in Washington, DC. The goal? To see if your soldier reported for duty on the day of battle. NOTE: Ol' Myrt here obviously has no experience with research in Confederate records. See DearMYRTLE's "Military: Carded Medical Records and Original Hospital Registers" describing with photos and text, my experiences when ordering these original files and books at NARA1. I found this most enlightening as my ancestor William H. Phillips, of the 19th Indiana, was sometimes away for medical treatment of syphilis. This same soldier served valiantly on the first day of the Battle of Gettysburg, receiving an injury to his left thigh at the railroad cut. As cousin Russ stated, our ancestors were both at Culp's Hill. My ancestor's 19th Indiana was on the northern-most edge of the elongated hill formation nursing their wounds, having lost their commander. My ancestor had lost 80% of his company due to death or injury, and so was not truly fit for battle with Cousin Russ' Maryland Confederate unit on the south side of the hill. My ancestor was subsequently sent to Douglas Hospital in Washington, DC. Why was there such a wide variety of hospital register books? IMAGE: (cropped) Courtesy of the Library of Congress. This sort of ambulance would have brought wounded soldiers to the nearest railway line for transport to a more permanent general hospital for long-term recovery. IMAGE: Courtesy of the Library of Congress. Mr. Myrt and I have viewed these in person at the state level for his ancestor serving in the 31st Iowa Infantry during the US Civil War. 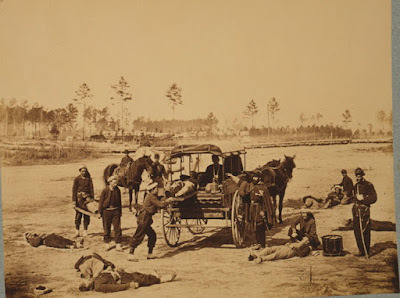 George M. Pell Died of Disease at the regimental Hospital Norm's Island, SC"
It's no longer sufficient to merely search an ancestor's US Civil War Pension File or his Widow's Pension File to see what the soldier, his comrades and his commanding officer may have stated about your ancestor's service. Where medical records and morning reports have survived, we may gain additional insight into our ancestor's war experience.